Chimes Music has been running for over 60 years. We’re proud to be keeping up the tradition of supplying music and all things musical to musicians around the world. 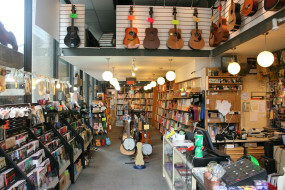 We have one of the largest selections of printed music in the country, as well as books, instruments and accessories for all musicians from the absolute beginner to the concert professional. Our established mail order service can get your music to you whether you’re in Aberdeen or Azerbaijan. As one of the few remaining independent music retailers, we pride ourselves in being able to offer a personal, efficient and knowledgeable service to our customers. The key to our specialist music service is our retail staff, who are qualified musicians and have years of experience and knowledge. We hope you enjoy browsing our website and can easily find what you’re looking for. We’re adding to it all the time, but please do get in touch with us if you can’t see what you need - our expert help is only an email or a phone call away. This is where Chimes differs from any other faceless Internet supplier. If you're interested to hear a bit more about any of our branches, please click on any of the links below. Alternatively, if you've ever wondered about the history of Chimes, please scroll down to see our timeline.
" 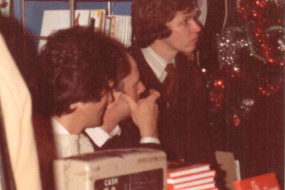 I opened my first music shop in 1974, a year after I'd left the Royal Academy of Music. It was only really supposed to be a part time job as I had great visions of becoming a professional pianist. But things don't always go to plan! 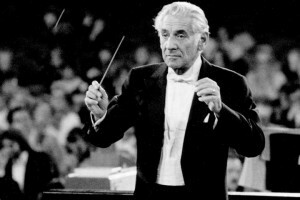 My father ran a newsagents shop in South Kensington with an empty basmeent which I turned into a little music shop." 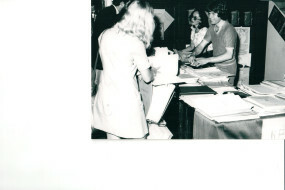 The Kings Singers signing copies of their book "A Self Portrait" in the early 70s. 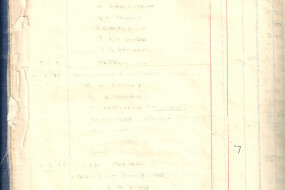 Original cash book from the early 70s, started by Tony's father-in-law who was a retired bookkeeper. 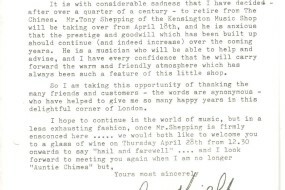 Things went so well that within three years Tony was able to move into his own premises just down the road called Kensington Music Shop. 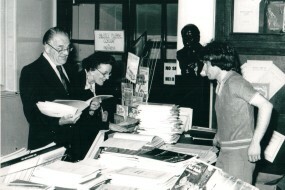 Tony and his wife Sue running a stall at the Royal College of Music for the International Saxophone Conference in the early 70s. 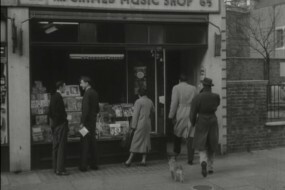 In 1977 Tony had taken over Chimes Music in Marylebone Hight Street. This coincided with his father closing his newsagents to semi-retire, so he helped run the Chimes shop. 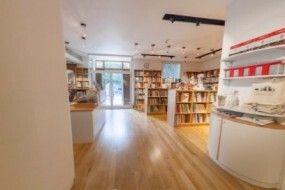 Then as the shop expanded they moved to no. 44. Here Paul McCartney once came in looking to buy a beginners guitar book as he wanted to learn how to read music! In 1983 Tony was invited by the GLC to open book, gift and record shops at the Royal Festival Hall on the South Bank. These were there until 1986. 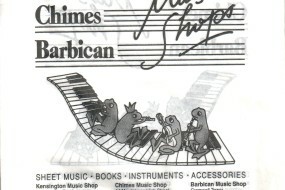 In 1985 Barbican Music Shop opened on the High Walk in Moorgate. In 1987 they moved from there to Cromwell Tower in the Barbican, where they have remained ever since. 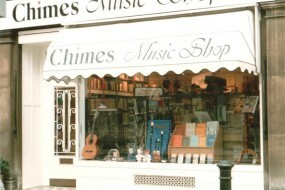 One of the original Chimes Music bags, with all three shops on. The frogs on the keyboard were designed by Tony's brother, Ron. 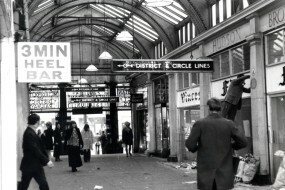 In 2000 the Marylebone shop closed. In 2006 Tony was approached by the Royal Academy of Music to open a shop in the Royal Academy Museum. At this point each shop adopted the 'Chimes' name. 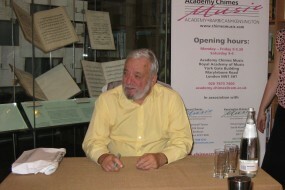 In October 2010 Stephen Sondheim came to Academy Chimes Music to sign copies of his new book "Finishing the Hat".